Denim has been a favourite for ages. With different brands, from high-end to street, making a variety of denim available for us each season, you can’t go wrong with denim staples like jackets and skinny jeans. They suit just about anyone — body type or skin colour, it doesn’t matter! Denim on denim kind of day. That said, sometimes it’s nice to mix it up once in a while. 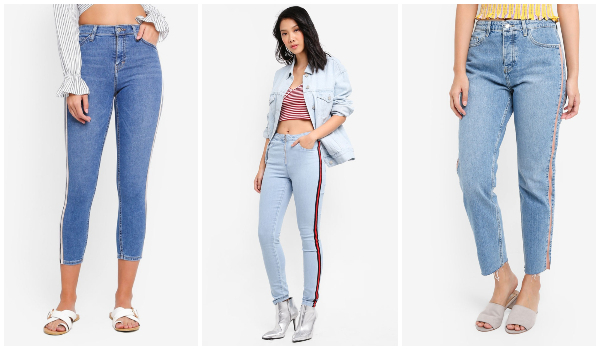 Make bolder fashion statements and choices with these denim upgrades for your next #ootd! Forget boring old skinny jeans. Go with something a little more adventurous and street style-approved. Side stripe jeans mimic on-trend track pants, but in a more suitable version you can wear to school (and even work, depending on your office dress code). Your classic skinny jeans has a more fun alter ego — this time in pastel! Baby pinks, lilacs, lime greens, and sea blues are just some of the colours you can make do and have fun with. With the mini skirt craze making a major comeback last year, one way you stand out in a crowd of denim skirt fanatics is with a two-toned mini. It’s unique, fun, and quite hard to find! Perfect for that brunch date, that casual day in school, or really just any day, the denim skirt is a flattering pick for every body type. The more casual version of the corporate chick’s lifesaver comes in denim! These wide-legged pants are comfortable and easy to wear, as they don’t lock up your legs in leg prison like skinny jeans would. The slouchy feel of the pant leg combined with the laidback fabric might seem a little too casual for the office, but you can definitely pull it off! Add your favourite blazer and statement bag to the ensemble and you’ll be fine. The cherry on top? White stilettos. Oversized is in. Dating back to the 80s, mom jeans are, well, your mom’s college best friend. While the classic skinny jeans will probably never be overthrown by other pant cuts, mom jeans are a great way to stray away from the usual. They give anyone a more laidback vibe without fully looking like a lazy girl’s outfit. Keep it boho-chic with the playsuit of your dreams. Denim dungarees are best worn with a white shirt underneath to achieve the most casual look. They’re a fun and easy go-to outfit as they’re both comfortable and easy to wear! You won’t be sacrificing style for comfort with this piece. Denim is the most reliable clothing there is, so feel free to experiment and play around with it so you can find the right style just for you! This article was first published by THREAD by ZALORA Singapore, written by Bea Punzalan.